Zeefax can conduct detailed Power System Studies on new and existing equipment to verify the fault rating of bus-bars and bracing, and to ensure the suitability and co-ordination of protective devices. ENSCO 71 is a Jack-Up drilling rig which was originally constructed at the Hitachi Zosen shipyard in 1982. The original GE motor controls comprised five 1163 KVA generators and four 1800 ADC SCR units with associated auxiliary transformer feeders and jacking units. The SCRs were assignable to two 1600 HP twin-motor Mud Pumps, a twin motor 2000 HP Drawworks and a 1000 HP Rotary Table. A separate feeder drives a 1110 HP Top Drive. A fifth SCR was added by Hill Graham Controls in 1985 to power a third 1600 HP Mud Pump, which was cabled to the main busbars. In early 2012, a decision was made to add a fifth 2500 KVA generator and an additional auxiliary transformer, to close-couple these to the main switchboard via a bus tie circuit breaker, and to include a dedicated feeder for the fifth SCR. A sixth SCR was also included in the switchboard extension to provide an alternative drive source for the third Mud Pump, effectively removing this load from the main switchboard. The switchboard extension, including full integration with the existing GE and Hill Graham equipment, was engineered and built by Zeefax. As well as providing an extension to the main 600 V switchboard, Zeefax also designed, built and commissioned an accompanying 480 V switchboard comprising of an incoming circuit breaker and a number of small moulded case distribution circuit breakers. The design and engineering process involved completing a detailed Power Study to examine the consequences, in terms of fault rating, of adding the new equipment. Various scenarios were considered, and the financial impact was assessed to determine the most cost effective interconnection configuration. As a result of the study the amount of upgrade work required on the existing equipment was minimised. The Power System Study was completed by gathering data about the existing switchboard arrangement and comparing this to the original, hand written, fault level calculations. The new calculations were performed using software modelling and verified to IEC 61363. 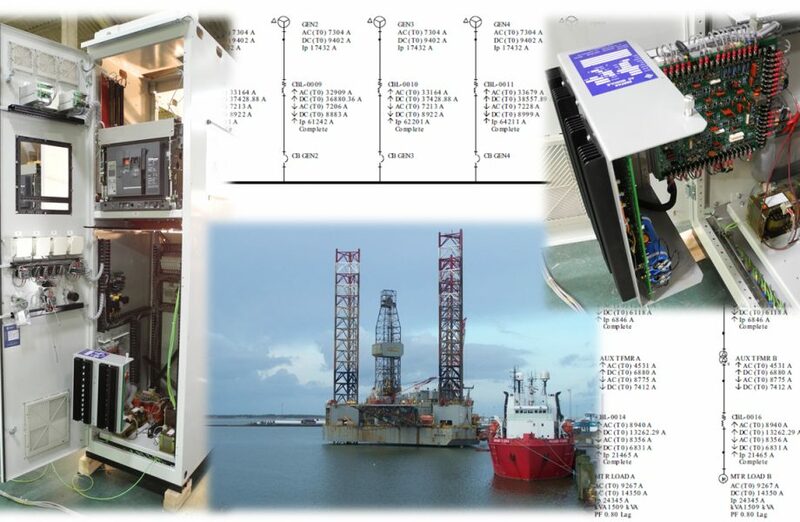 The IEC 61363 Short Circuit study represents conditions that may affect typical marine or offshore installations more significantly than land-based systems, including more emphasis on generator and motor decay. This confirmed the original calculations were accurate. The consequences of adding the new equipment were then considered and the appropriate decisions made and incorporated into the design. As well as considering the effects of fault currents, Zeefax also completed a complete protective device co-ordination study to confirm and ensure that proper co-ordination was established for all operating scenarios. This included the existing equipment as well as the components in the switchboard extension, and the new 480 V switchboard and transformer. Finally, the study also included calculating the strength and current-carrying capacity of the busbars under normal and fault conditions to establish the correct busbar sizes and bracing. The completed Power Study package was submitted to, and approved by ABS (American Bureau of Shipping).